From the early fifteenth century, in the context of increasing conflict against Muslims in the Iberian, Balkan, and Anatolian peninsulas and in the context of European maritime exploration and participation in global trade, including in African slaves, Black figures began to take on more fantastical, exotic, and degrading features even as older traditions continued. They appeared as monsters, conquered enemies, or noble savages and in these forms served as symbols of military accomplishment, commercial success, or conspicuous luxury. In this period Black figures became a more common heraldic feature across the German lands. It was in this context that Albrecht Dürer invented his own family crest. It features a shield with an open door, a play on his last name, crowned with a Black man with an earring. Perhaps he included this figure merely to follow the fashions of the better families of the region, or perhaps he also intended it to signify his cosmopolitan outlook. 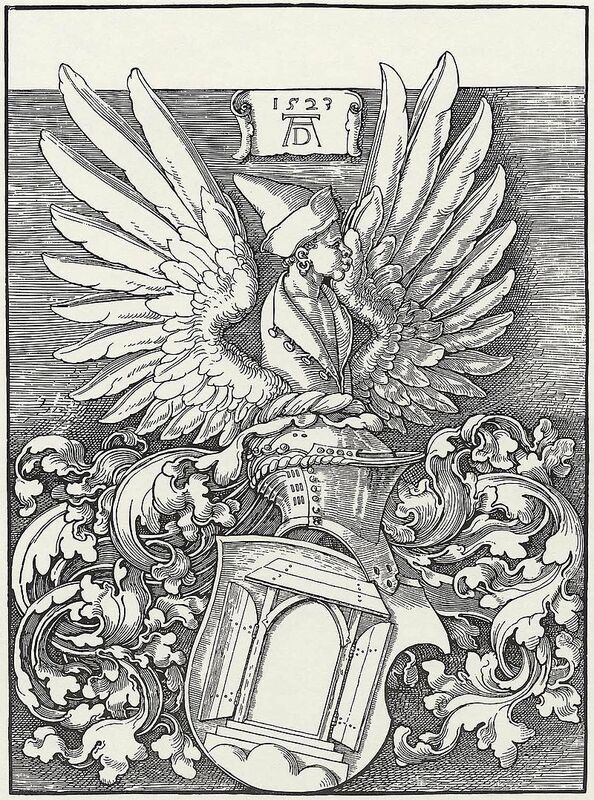 Source: Albrecht Dürer, Coat of Arms, Grafische Sammlung Albertina, Vienna, via Wikimedia Commons. Albrecht Dürer’s family crest (1523) by Jeff Bowersox is licensed under a Creative Commons Attribution-ShareAlike 4.0 International License.